More than just trendy and buzzy, fashion is largely about emotion. As such, most aficionados will agree that it's an art form in the truest sense, so it's no surprise that fashion and film have always enjoyed a close relationship. In the past few years, this has translated into a blossoming sub-genre of beautifully produced, often branded content, and Karl Lagerfeld's newest film for Chanel, starring Kristen Stewart promises to awe and inspire. Like everything that Lagerfeld has a hand in, the driving philosophy, art or not, seems to be "go big or go home." From his Fendi show on the Great Wall of China to the upcoming Chanel Resort presentation in Cuba, a hotspot of politically-charged media attention, it's all about visibility. So it's no surprise that Lagerfeld would tap a blockbuster movie star, who has held the lead in billion dollar film franchises and indie flicks alike (with a dose of tabloid fodder for good measure), as the star of his upcoming Chanel film "Once And Forever," to be screened at the Metiers D'Art show in Rome on December 1. In a truly meta twist, Stewart plays an actress who is playing the role of Gabrielle Chanel. It's a film about a film, and it also flirts with the ever-present theme of youth and aging that is a mainstay in the aesthetically-driven world of fashion, as Stewart plays a young Chanel, and British-American actress Geraldine Chaplin plays Chanel in her later years. The interesting twist here is that everyone is more drawn to Chaplin, who in one scene in the film is "fawned over by members of the film crew as she’s seated in front of her makeup mirror." Stewart's character, on the other hand, is a quarrelsome young actress that "nobody wants to be with [because] she’s so nasty," Lagerfeld explained to WWD. It's quite the departure from the seeming obsession with youth that is more of a reality in the industry. Lagerfeld himself, although 82 years old, is often seen socializing with the Jenner sisters, Cara Delevingne, male model and singer Baptiste Giabiconi, and yes, Stewart, all of whom are in their 20s or fast approaching them. 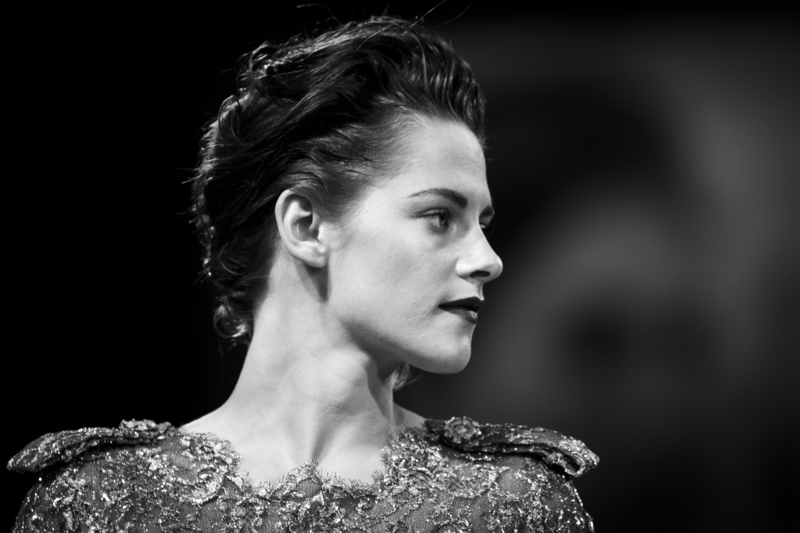 Casting-wise, given Lagerfeld's love of Stewart, it seems like a natural fit, and one born of true respect and admiration. In the WWD piece, he admitted, “I think she’s one of the greatest actors of her generation.” In fact, he also reveals that he conceived the role with her in mind. Seems like the feeling is mutual — Stewart has stunned in Chanel in recent seasons, and totally earned her leading lady role. She nailed it in a campaign for the Chanel Spring/Summer 2015 Eyewear Campaign earlier this year. Could it have been a coincidence that the predominant prop in the campaign was a vintage video camera? I believe that's what they call "foreshadowing" in cinema. OK, so she took some heat for this look, but it also goes to show that Lagerfeld believed in Stewart enough to let her personal style shine through while still representing the brand. There's usually something so distinct about Chanel's ad campaigns, but this one, for the Dallas-inspired collection, is a huge departure, from the sharp photography style to the grungy Americana vibes and layering. She definitely inspires Lagerfeld to step outside his comfort zone. I think that's what they call a "muse," oui? Anyone else think Chanel's casino-themed Haute Couture show must have been the most fun anyone's had at a fashion show in years? Stewart looked powerful in an androgynous suit as she tried her luck at roulette alongside Julianne Moore in July. She wore a black and gold sequined runway look to the Met Ball in 2014. While it was relatively conservative for one of fashion's biggest nights, it was a very dressy look for the normally more casual actress. The following year, K. Stew skipped the Met Ball, but wore Chanel in South Korea on the same night, serving up some futuristic First Lady vibes. A double-breasted blazer and shorts, with Lagerfeld-ian gloves, were a great entrée into Chanel for Stewart back in 2013. One more look at that glove, that now in retrospect seems to speak volumes about the mutual understanding between the two. Anyone else OK with fingerless gloves as the new friendship bracelet? I'm on board.